Pennsylvania voters were key in pushing Donald Trump to his 2016 presidential election win, and it looks like they'll be just as valuable to fictional President Frank Underwood in season 5 of "House of Cards." Season 4 ends in the middle of an election year, with Underwood being challenged by New York Gov. Will Conway. 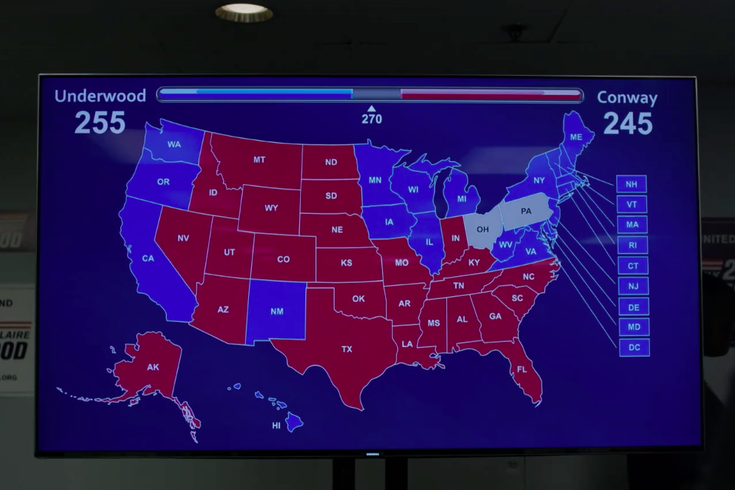 Netflix released a new trailer for the upcoming season Monday, and for a brief moment, we see an electoral map on a screen in front of a wall covered by Underwood campaign signs. On the map, Underwood — played by Kevin Spacey — has 255 electoral votes and Conway has 245. The only states not locked up are Pennsylvania (20 electoral votes) and Ohio (18). That means winning either state would put Underwood over the top, but Conway would win if he takes both. Maybe that means some campaign scenes in the Keystone State? There have been local plotlines in the political drama series before, with the most prominent example being Philly congressman Peter Russo. Whether or not the Underwoods retain the White House is obviously a huge plot point in season 5, and the new trailer doesn't explicitly point one way or the other. The new season will be available on Netflix May 30. You can watch the entire trailer — which shows Frank and his wife/running mate Claire Underwood being as devious as ever — below.